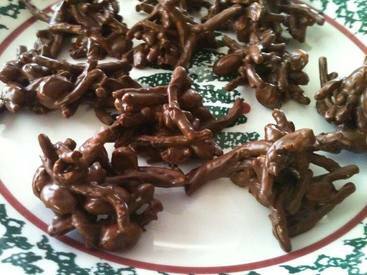 Or commonly known as chow mein noodle cookies! In honor of National Noodle Day, I thought I would share one of my very favorite cookie recipes. I started making this when I was a Girl Scout. Of course, all the rage now is salt on top of cookies. Who knew that this cookie was fashionable before it's time, because it has salty nuts in it?!! This recipe also makes adorable nests for Easter time. This is a great, easy, no-bake recipe. I personally like the butterscotch/chocolate combo, but you may like peanut butter/chocolate.